Lecia Lambie goes live tonight at 7pm ET for auction in the monthly Dollectable upload. This is a 25 hour auction, which ends tomorrow night at 8pm ET. Lecia is coming with a pair of cotton velour overalls, t-shirt, 3 cotton flannel Velcro diapers, wool felt wipes case with cotton flannel wipes for all those diaper changes, a bottle and a diaper bag to carry all of her goodies in. She also comes with a signed birth certificate with her name and birth date and an extra blusher cloth to add additional color to her cheeks and nose. Lecia is approx 13″ size. She is made in the waldorf method with a rolled wool head and stuffed with wool. 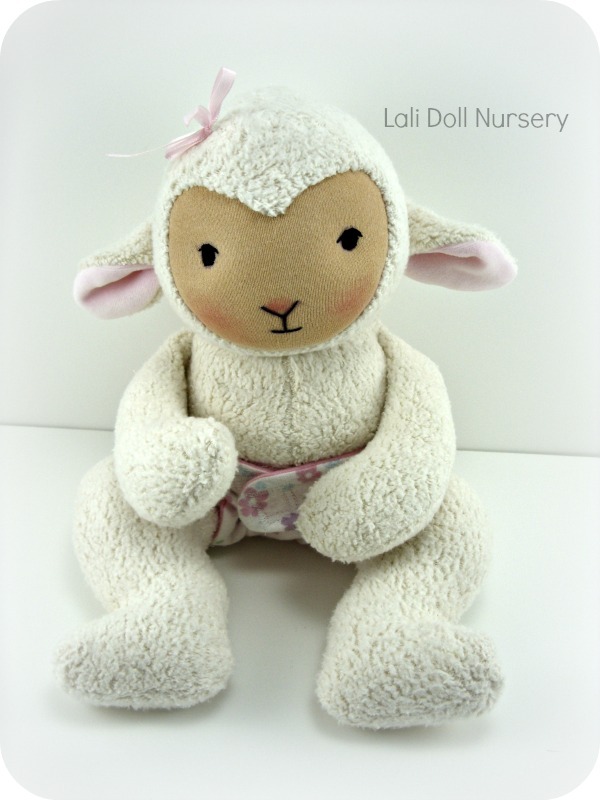 Her fleece is made from organic cotton fabric and she has hand embroidered facial features. Lecia says “Don’t forget about all of the other AMAZING dolls and toys for sale in the Dollectable shop Saturday night Sept 7th, which are all live at 7pm ET”.